I'm a big believer in the old chestnut 'if you wouldn't put it in your mouth, don't put it on your skin', since our skin is very good at absorbing the products we use on it. I also believe that the use of animal products in toiletries and cosmetics is unnecessary, and testing on animals is unethical, so while I'm not a vegan I do try to buy from cruelty-free producers. For these reasons I was thrilled to have the opportunity to give an honest review of some products from Arbonne, a company I'll be honest I hadn't heard of until my friend and former mentor introduced me to them. Arbonne originated in Switzerland and now have their base in the USA. They started out in 1980 with a vision to produce products based on "pure, safe, beneficial" botanicals. They don't sell over the internet or through retail outlets, preferring the personal touch of a trained Independent Consultant to identify each customer's needs and guide them to the products which will be of greatest benefit to that customer. This is where my friend comes in. Lesley Lambeth is a walking advert for the company's ethos, with her dedication to improving the lives of the people around her. I tried two product ranges. The first was to be a treat for me, although we all ended up enjoying the products in the Aromassentials range. The kids really loved the Unwind body mist, which I spritzed on their feet at bedtime. It had an old fashioned aroma which, while pleasant, wasn't my favourite. For me the best scent was that of the Awaken range. Matt and I tried out the Awaken salt scrub after an afternoon at the allotment and watched the soil stains embedded in our skin melt away. My hands felt great afterwards, it totally resolved the dry, after digging feel of them, and I kept sniffing the backs of my hands where the expensive-smelling aroma lingered for a long time. I am also in love with the bath and shower gel from this range, although I don't always manage to wait until the morning to use it as it is equally delicious for a shower after a hot day (just in time for us getting a few days of actual summer weather). 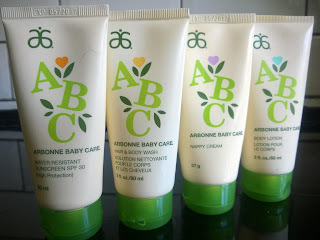 The second product range we tried was the ABC Arbonne Baby Care set, including sunscreen, body wash, nappy cream and body lotion. The timing of the sun arriving was perfect for trying out the sunscreen. As much as I've wanted to, I've never got on with eco brands of sun cream, finding them thick and greasy, and the zinc oxide leaving the kids looking like the time they got hold of a pot of sudacrem and smothered it all over themselves. The brands I tried before also left us sweating under the thick cream. The Arbonne sunscreen seemed to have the same problem for us initially, going on as a thick white paste, but it actually rubbed in far more effectively and left our skin far less greasy. The range is unperfumed, but the botanicals included give it a very faint and pleasant smell, which is a great contrast to the strong smell of our usual brand (which had butterflies trying to land on Toby's face in a tropical glasshouse a few weeks ago). There was no odd sensation of sweating under grease that we've had with other eco brands, and after trialing it on Toby at an afternoon at the allotment, and again during a hot morning at a car boot sale, it definitely seemed to work effectively. I prefer the 'powder dry' sensation of our usual brand, but the Arbonne sunscreen comes without the dodgy chemicals and is less greasy even than the other mainstream brands we tried. Since the boys are well past nappy days, I tried the nappy cream out myself - on my knees! I can see this being a great secret ingredient to a beauty routine as it moisturises thoroughly without being too heavy, and allows skin to breathe as their are no pore blocking petrochemicals in it. I used the body lotion on my legs after epilating them, and it soothed and moisturised effectively without being heavy. 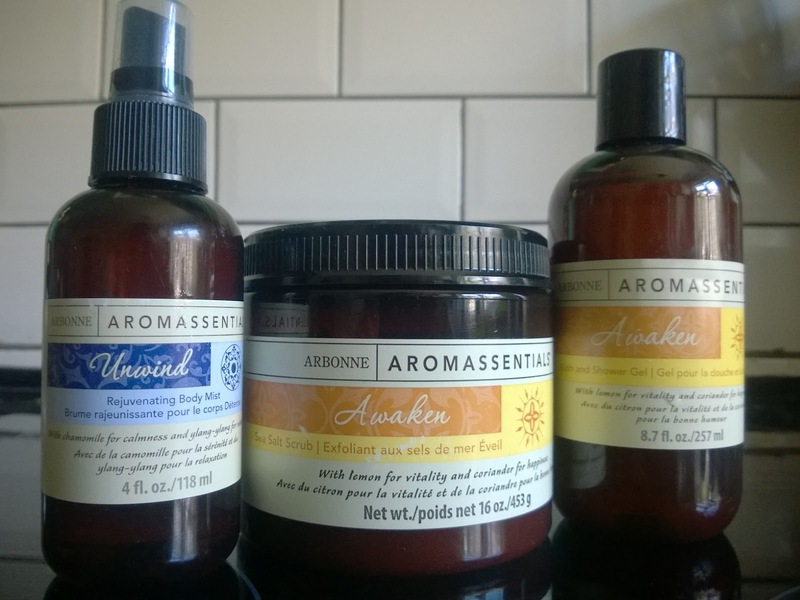 From what we trialed, this seems like a really good set of products, and from what I've read the ethics of the producer is impeccable, so I was more than happy to get to keep my favourite of the things we trialed - the Awaken shower gel. The quality of the ingredients is reflected in the price, but as with many expensive products a little goes a long way. The scent of the shower gel will almost make me look forward to jumping out of bed in the morning. I have no financial interest in this company. I was lent the above products by my friend in return for an honest opinion on them, and I offered to write about them as I was impressed with the company ethos and the products I tried. All opinions and the images above are my own. For more information see Lesley's website here and Facebook page here, which is also a good source of healthy living tips and recipes.